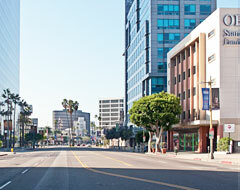 A 16-mile long boulevard that crosses Los Angeles’ five main business districts, Beverly Hills, and Santa Monica; Wilshire Boulevard’s dozens of landmarks include Art Deco architecture marvels like The Majestic Crest Theatre, the Palisades Park overlooking the ocean, and the Page Museum at the La Brea Tar Pits. A narrow, two lane road built into the eastern part of the Santa Monica Mountains, Mulholland Drive offers breathtaking views of the Hollywood sign, the San Fernando Valley and downtown Los Angeles. Featured in scores of movies, novels, and songs, driving through Mulholland Drive and its vistas will leave you feeling elated. Famous for its star turn on Baywatch, Santa Monica Beach is not only a beach, but an amusement park, a picnic area, a park and a gym. 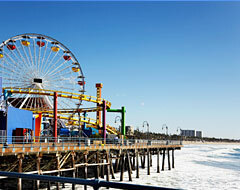 The Santa Monica Pier is a 100-year old landmark decorated by Pacific Park’s roller-coaster and a solar powered Ferris Wheel that make it a truly unique sight. 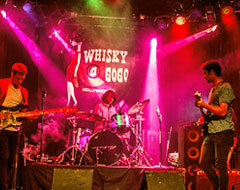 The first bar to feature a female DJ in a cage, Whisky A-Go Go stakes claim on starting the go-go dancing revolution. A revered rock and roll institution since it opened in 1964, it was the launching pad for many now legendary musical acts. The Doors became the house band in 1966, and it also hosted classic rock legends like The Who, Led Zeppelin, and Jimi Hendrix. 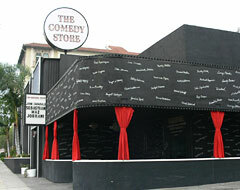 The Comedy Store has been the training ground for famous comedians since it opened in 1972. Comedians like John Belushi, Dave Chappelle, Jim Carrey, and David Letterman got their start here during amateur nights. This is a great spot for those looking for a good laugh or for those interested in stand-up comedy history. 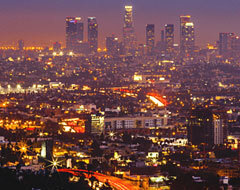 Called by the L.A. Times the “most consistently hip club in town,” Johnny Depp opened The Viper Room in 1993. A longtime favorite of Hollywood's ultra-elite, original regulars included actors like Jennifer Aniston, Christina Applegate, Angelina Jolie and Leonardo Di Caprio. The Viper Room is also a music venue known for booking trend-setting alternative rock acts, many attended by celebrity music lovers. 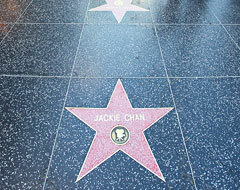 Inaugurated in 1960 with the engraving of 2,500 blank bronze “stars” on the sidewalks of Hollywood Boulevard, the Hollywood Walk of Fame honors living and dead celebrities whose impact has changed entertainment history. 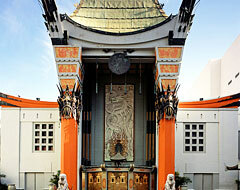 Impossible to miss, the TLC Chinese Theatre has an imposing exterior in the style of classical Chinese pagodas. Probably the most famous theatre in the world, the Chinese Theatre has served as a location for movie premieres since 1927 and is a center of film culture, still holding film events in its 2,200-seat facilities. A gigantic amphitheater carved into the Hollywood hills, the Hollywood Bowl has seating capacity for 17,000 people and is known for the famous band shell that graces its stage. 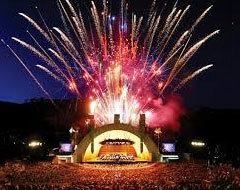 The preferred venue of artists like The Beatles, The Doors, and world-class orchestras, a Hollywood Bowl performance is an event with one-of-a-kind acoustics that can’t be missed. This three-block shopping district is the ultimate destination for the fashion-obsessed. 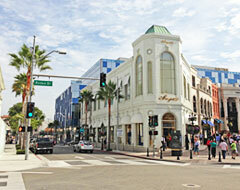 Premier stores like Armani, Christian Dior, Bulgari, Gucci and Prada are all found together in this relatively small area. 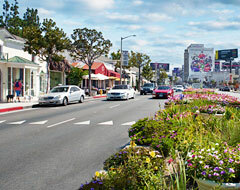 A more diverse shopping strip, Melrose Avenue caters both to the demanding, high-end shopper and to those looking for sweet bargains. Check out Wasteland, a quirky thrift shop, and Posers, a shop filled with punk rock fashion. 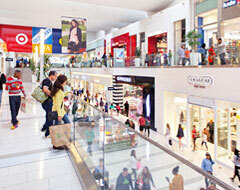 A shopping mall featuring more than 160 boutique shops, a food court and mainstream national brands, the Beverly Center is the epitome of shopping with four floors full of shops.